Well, this was a hard nut to crack, that’s for sure. Not only was I forced to read some protocol-specs but also this article required quite extensive background-work and a whole lot measurements and logging to be done. Please do note a few things! I’m just an RC-hobbyist as anyone else. I’m in no way professional software- or protocol-engineer in any way. All opinions and conclusions are my own unless otherwise stated. This is WorldWideWait, always use source-criticism. Well, not when that’s out of the way, here we go! Failsafe on and off, transmitter on 100Hz. It certainly is not easy for manufacturers of different devices to keep up with different revisions of other’s firmware’s and other changes in systems. Thankfully there are specifications to follow so we can read up on these things. EX-bus protocol-specs are available on Jetimodel page but there is a catch. Part of the protocol is proprietary ie. not public. So, this means we are not allowed to “get inside” the whole traffic between Spirit and REX, unfortunately. But, we can find something, let’s have a look. PPM and UDI take use of the transmitters setting “Device explorer” -> “REX6” -> “General Settings” -> “Output period”, EX-bus protocol does not. Regardless of the value of this setting EX-bus packets are timed in 10ms intervals. That means the only setting that affect this timing is transmitters frequency, and like it’s said many times, usually today it’s 100Hz. 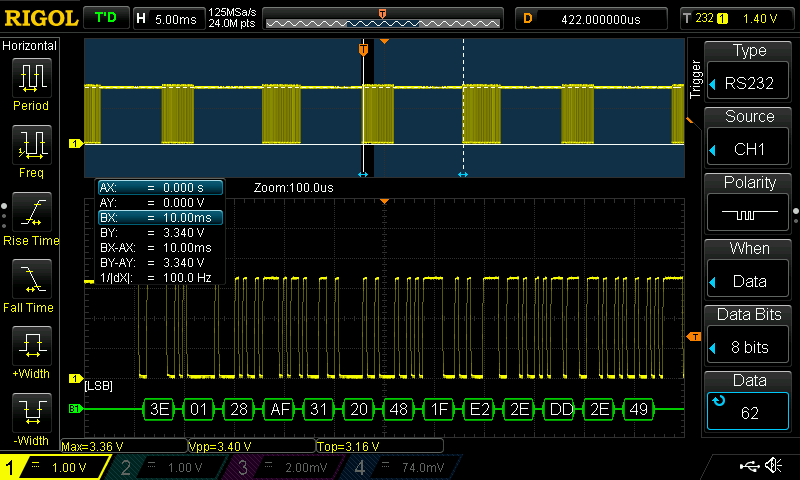 Looking at the scope this is confirmed, changing the value to 50Hz the EX-bus packets are 20ms apart. This is quite wise in my opinion. 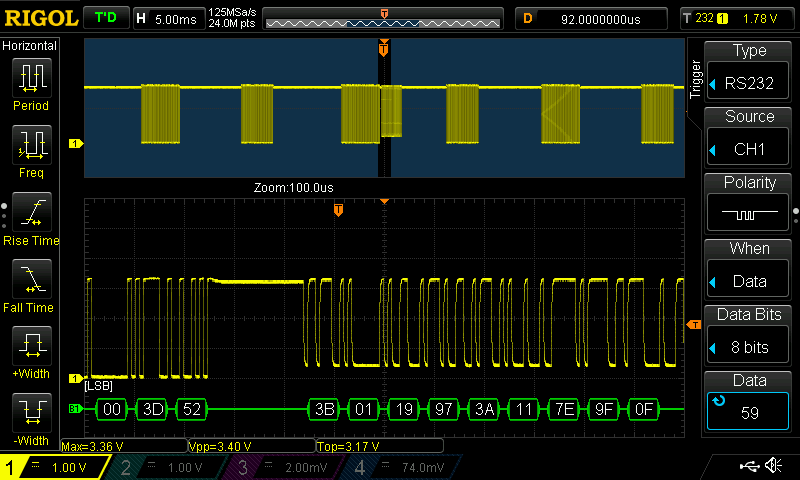 Transmitter can send values in 10ms intervals at most, why would the receiver send values with double frequency? Also, there is plenty of time to keep the communication “clean” with no cluttered packets floating around. Alright, we all like pictures, let’s take look. The size of EX-packet does vary a bit depending on the data it contains, but generally it seems to be around 3.3ms in length. You can see in the picture above a slightly longer packet on the left side. Also there are two things contributing to the “signal purity”, the packet is short and they are 10ms apart, that means the issue with REX firmware 1.00 and UDI is not possible. I also confirmed this by doing the test’s with both 1.00 and 1.01e firmwares, I could not find any difference in signaling between them. The data is what the protocol says it should be. I was also curious what and how often Spirit is responding, so let’s search for that. Slave responds right-away as can clearly be seen in the picture above, response is right after the asked information. 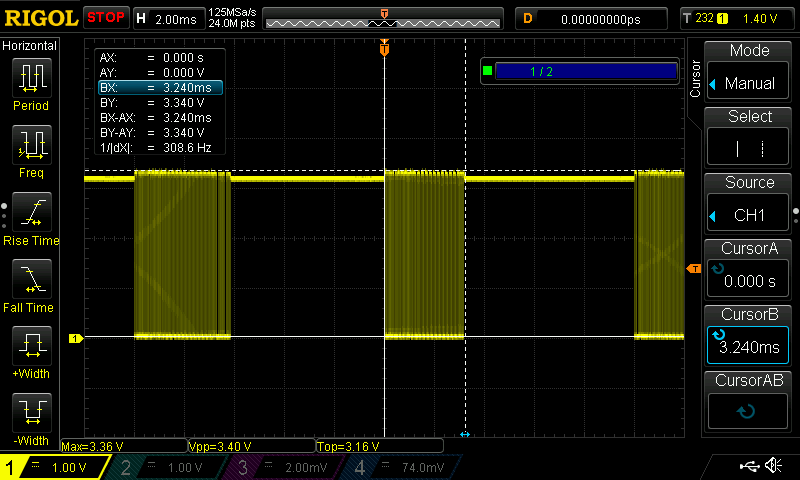 We can also see in the picture that Spirit’s response is different in signal strength by approximately 0.3V which is insignificant in this application. I put the receiver and gyro to a test-bench and had them on for about 45 minutes while shaking them more or less violently around, sometimes even hitting them a bit, all to provoke some true errors. Came up with nothing basically, no lost communications, no lost signals, no nothing. Totally clean logs except for some obvious extreme vibration-mentions. I even connected my power-hungry Savox-servos from my 800 Xxtreme to Spirit to tease it even more, no errors even them. So I was unable to re-produce the behavior jmackey had with his setup. Good for me of course but I really would have liked to find out the reason for that. Who did what to what firmware? REX’s update mentions “Increased minimal gap between UDI and ExBus data packets.” Ok, they fixed the UDI-issue. But hang on a minute here. “And EXBus…” Uhh, what gap? Protocol states there’s the 4ms gap and packets are by design sent with 10ms apart? What am I missing here? I could not get any packet’s to “jump around” to anywhere near how they did on UDI and firmware 1.00. So I am a bit interested in this. I’ll send a line to Jetimodel and ask for more information, they have been very forthcoming on these issues before so I’ll update this article after eventual response from them. Well. I’m going to get first-hand experience with Spirit and EX-bus quite soon. My build of a small fun-heli is almost done so we’ll see how it goes. I know that after doing the background-work to this article I’m confident to use EX-Bus and Spirit in my heli. Other than that the general rule still applies, it there’s anything strange happening to your heli, investigate thoroughly. Always make sure that safety comes first, and nothing else. Now, it was a long (and theoretically dry) article, go out and fly! Did you get a response from them on this? Woops, posted wrong, look below. – The packet spacing is not necessarily consant: "If RF signal quality is good then the period is stable 10 ms (in 100Hz mode), but if the signal is weak then the packets are delivered to the receiver irregularly and ExBus period is irregular also." There's been issues with EX-bus and Spartan, Spartan dev has a beta-version of spartan.bin to test for, should be available soon. Looks like there's a new REX FW coming up soon.